The biggest shopping day of the year is almost here. You can find some great deals on Black Friday, and that goes for books as well—but it’s the day after that when book lovers and the people buying gifts for them will find the best bargains. Independent bookstores have run with Small Business Saturday over the last few years as a shop-local alternative to Black Friday, with one of the big draws being author Sherman Alexie’s Indies First campaign that organizes authors to volunteer as booksellers for the day at stores around the country. There’s also Plaid Friday, which started in California five years ago and came to Minnesota in 2015 by way of the Twin Cities Metro Independent Business Alliance. Plenty of bookstores in the Twin Cities and around Minnesota are participating in one or more of these events, so without further ado, here is this year’s guide to the sales and other events going on this weekend! Addendum Books in St. Paul will have 40% to 50% off select books on Friday. The store is also holding a launch party for Gap Life by John Coy at 6:00 p.m. In Park Rapids, Beagle and Wolf Books and Bindery will again be participating in the Yuletide Sampler, which begins at 5:00 p.m. Friday and has local businesses running specials and handing out treats in the run-up to the 6:00 tree lighting. All books listed in Beagle and Wolf’s holiday catalog will be 15% off, and the store will be open until 7:00 p.m.
Birchbark Books and Gifts in Grand Marais will be having a 25% off storewide sale (excluding red-tag items) both Friday and Saturday. Buffalo Books and Coffee in Buffalo will be taking part in Plaid Friday with 20% off storewide. At Cherry Street Books in Alexandria, games and puzzles will be buy one, get one 50% off on Friday, Saturday, and Sunday. The store also has a table of gift items at 50% off and will offer homemade holiday cookies for all shoppers. DreamHaven Books and Comics in Minneapolis will be running sales, discounts, and giveaways all day. Drury Lane Books in Grand Marais is holding its annual holiday sale, with 15% off storewide and 20% off hardcovers. The store will be open extended hours (10:00 a.m.–6:00 p.m.) Friday, Saturday, and Sunday. As another “counterpoint to the madness of Black Friday,” Eat My Words Bookstore in Northeast Minneapolis will be hosting the launch party of local author Penny Johnson’s new novel, The Forget-Me-Nots, at 7:00 p.m. There will be homemade cheesecake and cookies, and everyone who attends will receive seed packets of forget-me-not flowers. At Eye of Horus Metaphysical in Uptown, everything in the store that’s black will be 13% off in honor of Black Friday. The Little Professor Book Center in Owatonna is having a 20% off sale Friday and Saturday. At Magers and Quinn in Uptown, make a purchase while wearing plaid on Plaid Friday and get a free gift. The store is also celebrating the Penguin Orange Collection by giving out free Penguin gear with all Penguin Orange purchases. Scout and Morgan Books in Cambridge is holding its annual three-day sale, with 20% off used books storewide. There is also an extra coupon available online and in the store’s free holiday catalog good for an additional 25% off one item. At Sixth Chamber Used Books in St. Paul’s Macalester-Groveland neighborhood, shoppers will get a $5 gift card for every $100 they spend on Friday, Saturday, and Sunday. At Valley Bookseller in Stillwater, “select books and gift items” will be 50% off. The store will also be running a special on gift cards: buy $100 worth and get a $20 gift card for free. On Small Business Saturday, Addendum Books will be open extended hours (11:00 a.m.–7:00 p.m.) and is hosting a massive list of local authors and illustrators acting as booksellers throughout the day, including Nancy Carlson, Geoff Herbach, Laura Purdie Salas, David LaRochelle, Shannon Gibney, Bryan Bliss, and many more. See the Addendum events page for the full list of guests and when they’ll be appearing at the store. At the Amazing Alonzo in Duluth, get a 10% off coupon for your next visit when you shop on Saturday. Beagle and Wolf Books and Bindery will host authors Donna Salli and Bob Guelker as volunteer booksellers, and the store will have live piano music and free refreshments on hand. 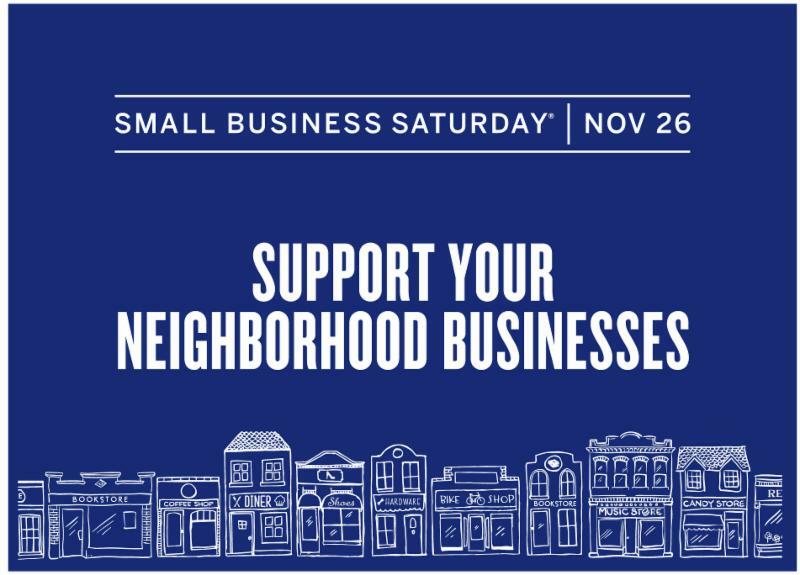 Participating businesses in Park Rapids will also be providing a backdrop for Small Business Saturday selfies—if you post a selfie on Facebook, Twitter, or Instagram and tag @visitparkrapids, you could win one of a number of drawings for gift cards throughout the day. Birchbark Books and Gifts in Grand Marais will be continuing its 25% off storewide sale from Friday. Birchbark Books and Native Arts in Minneapolis’s Kenwood neighborhood will have refreshments available and giveaways running throughout the day. Boneshaker Books in Minneapolis—which happens to be a drop-off site for the Twin Cities Geek Toy and Book Drive—will be having a 10% off sale as well as a small craft fair. The monthly Cracked Walnut Reading Club also happens to be at the store at 1:00 p.m. 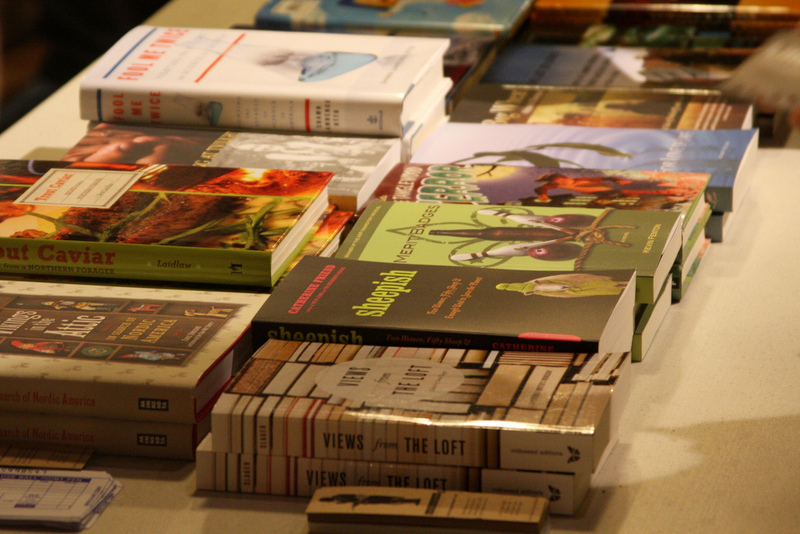 The Bookstore at Fitger’s in Duluth will be serving treats and refreshments and raffling off prizes throughout the day. Local author-illustrator Chris Monroe and author and former mayor Don Ness will be signing books from 1:30 to 3:00 p.m.
Buffalo Books and Coffee will be having a number of specials and drawings on Saturday. Chapter2Books in Hudson, Wisconsin, will have refreshments all day and will be giving out free tote bags and other giveaways while supplies last, including the chance to win a tote bag full of books. Cherry Street Books will be continuing its buy one, get one 50% off sale on games and puzzles as well as having its holiday cookies to snack on. The store will also be giving out grab bags with free ARCs with purchases, and families who want a break from shopping can catch Cherry Street’s weekly story time for kids at 10:00 a.m. There will be a number of promotions at DreamHaven Books and Comics, including 20% off new magazines, comics, and graphic novels and 50% off used hardcover, paperback, and bagged collectible paperbacks (excluding showcase books and books behind counter). Drury Lane Books continues its extended hours (10:00 a.m.–6:00 p.m.) and sale of 15% off storewide and 20% off hardcovers. Eat My Words Bookstore is having its third annual “anti-capitalist-excess” sale, with discounts throughout the day on Saturday. At 3:00 p.m., the store will host music historian and former army musician Bruce P. Gleason for a reading, discussion, and signing of Sound the Trumpets, Beat the Drums. Lake Country Booksellers in White Bear Lake will be having a 10% off sale. The 20% sale at the Little Professor Book Center continues Saturday. Magers and Quinn will be hosting the editors of two local magazines as guest booksellers: Joanna Demkiewicz and Kaylen Ralph of the Riveter from 1:00 to 2:00 and Moheb Soliman and Lana Barkawi of Mizna from 2:00 to 4:00 p.m.
For its first Small Business Saturday since opening in September, Milkweed Books will be offering $100 gift cards for $80, both in store and by phone and e-mail orders. Moon Palace Books in South Minneapolis will be giving away copies of its winter catalog, which comes includes a coupon, as well as free downloadable audiobook copies of The Absolutely True Diary of a Part-Time Indian and free copies of We Should All Be Feminists to the first 25 customers. The store opens early on Saturday, at 9:00 instead of 10:00. An Open Book in Wadena (which is currently looking for a new owner) will be giving out free tote bags with all purchases, and author-signed ARCs with purchases of $25 or more, while supplies last. There will also be giveaways for books and T-shirts. Paperbacks and Pieces in Winona will have a number of discounts running, including books up to 40% off. Local author Frank Bures (The Geography of Madness) will also be in the store from 10:00 a.m. to noon. Red Balloon Bookshop on Grand Avenue in St. Paul will be open to 8:00 p.m., and authors Kelly Barnhill, John Coy, Shannon Gibney, Kurtis Scaletta, Stephen Shaskan, Trisha Speed Shaskan, and Lauren Stringer will be in the store as honorary staff members. Scout and Morgan Books’ three-day sale continues Saturday, with 20% off storewide and an extra 25% off coupon available. Sixth Chamber Used Books’ three-day promotion continues as well, with customers getting a $5 gift card for every $100 spent. SubText Books in downtown St. Paul is holding a Used Book Extravaganza, with some books as low as $1.50. There will also be other special sales, live music, and visiting authors throughout the day, including local mystery novelist Barbara Deese. As on Friday, Valley Bookseller will have select books and gift items on sale at 50% off and will give out a free $20 gift card with the purchase of $100 in gift cards. Village Bookstore in Grand Rapids will be running specials yet to be finalized at the time of this writing. Also keep in mind his list does not include Minnesota’s many great comic shops, such as Comic Book College, High-Class Comics, Mead Hall Games and Comics, the Source Comics and Games, and more. And plenty of non-bookstore businesses are having promotions this week, including many of the drop-off locations for the Twin Cities Geek Toy and Book Drive!